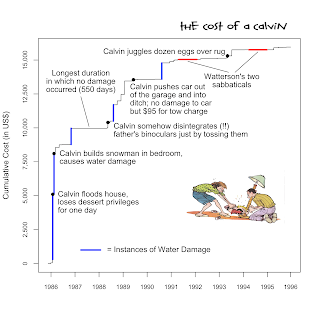 How much does a Calvin cost? 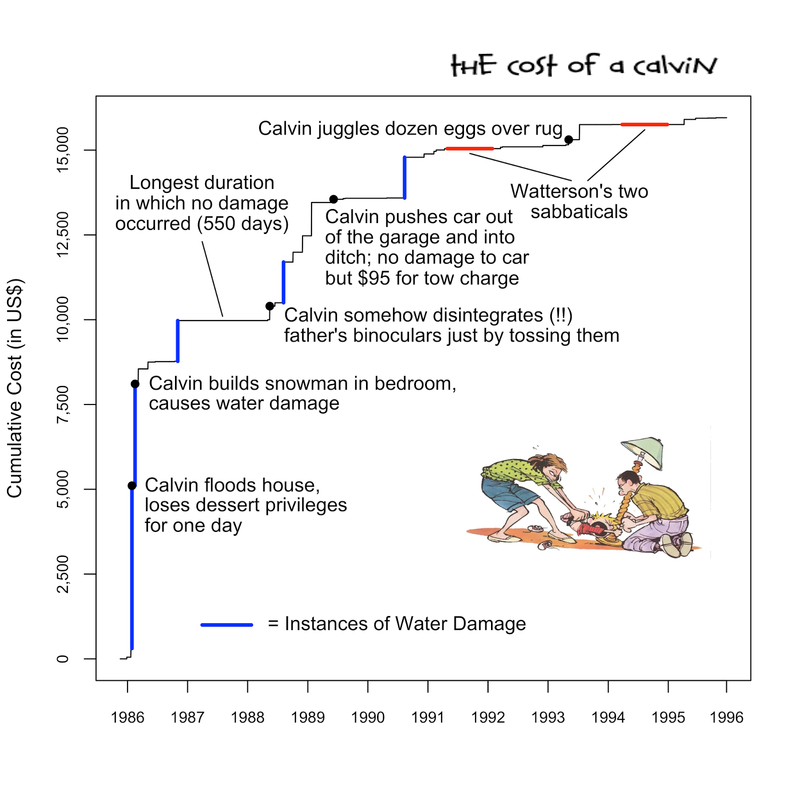 The chart had me wide-eyed because I realized that if this was a real kid, we would be shaking our heads. Having children are expensive. Forget damage. Just diapering and feeding them cost money. Our lab spends a shameful amount of money buying Pepperidge Farm Fish because the children eat them by the handful; some kids even stuff them in their pockets, shoes, and bags. I see these fish in my nightmares. I see the crumbs and empty bags in my nightmares. And these are just goldfish. Just fish. Don't get me started on juice boxes. You haven't seen the stuff that I have to explain to my PI (principal investigator, i.e., The Boss). Like when a kid decides our bookshelves are for doing gymnastics from, or that their kid brother is for bouncing things off and, of course, the thing ricochets off their brother and breaks something. But I take Watterson's piece with a grain of salt. Children are expensive. They break things. They get dirty. But they're loads of fun. And they're worth it. Wouldn't trade my job!